I’m going to explain why we are animated Earth. Were going to learn about Tribalism, and what we can learn from our ancient ancestors about how to live well. Indigenous people like the Duwamish tribe are keen observers of nature, and have articulated scientific truths in their own cultural language. Imagine an imaginary line drawn underneath the earth and her oceans. It interconnects a network of hidden passages and links all the sacred places of Earth. If that line breaks, calamities will ensue; earthquakes, hurricanes, and tsunamis shall follow. It is interesting to note such imaginary lines do exist. Science calls them fault lines, and we are threatened by them and other global changes. However, for the Kogi people of the Siena Madre in Columbia, these imaginary lines and network of sacred places of Earth represent the stability of Earth. They teach us that without them or disrupting them; the beautiful world shall perish. They teach us these truths not from a scientific lens, but a different lens. The Kogi shamans believe their work maintains the balance of nature; as such, our behavior and treatment of Earth threaten the very web of life. 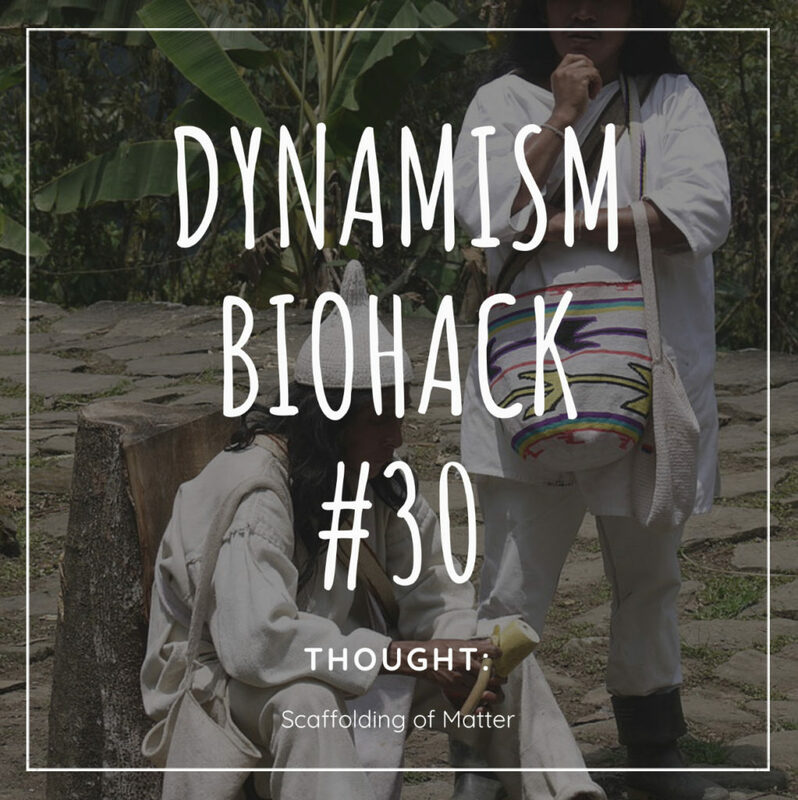 And that leads me to Dynamism Biohack: Thought: The Scaffolding of Matter. The Kogi people say that thought is the scaffolding of matter; that without thought, nothing could exist. The Kogi people are not telling us that we only need to take better care of nature. They are showing us that we are ONE with it. Which, interestingly enough this is being studied by science in the world of the human microbiome. If we have 100 trillion cells, we have 10 times that in terms of bugs living in us and with us in symbiosis. These bugs come in a variety of species, which we are only beginning to understand. This includes bacteria. These bugs have essential functions in every part of our bodies, as important as that of cells. In other words, without our microbiome, as the Kogi people predict, we would cease to exist. We see now that what we do to nature we do to ourselves; its conquest brings our death. It is not necessary to adopt, part and parcel the entire Kogi philosophy. Science has recognized that life is composed of interdependent systems within systems, just like a human body; that soils extensive root systems are as complex and vast as brain tissue; that water can carry information and structure as the circulatory system; that the Earth and the sun maintain homeostatic balance just as a body maintains balance and absorbs vitamin D from the sun. Every part of nature and its vast ecosystem is as essential to us, as we are to it. Nature does not depend on something supernatural, like some external event. The wanting is an organic process, a vital principle that guides the development and functioning toward an unfolding wholeness. To that end, we need to stop cutting down the forests and drain swamps, damming rivers and disrupting ecosystems with experimental sciences that hinder the creation, thus exploiting nature and men. 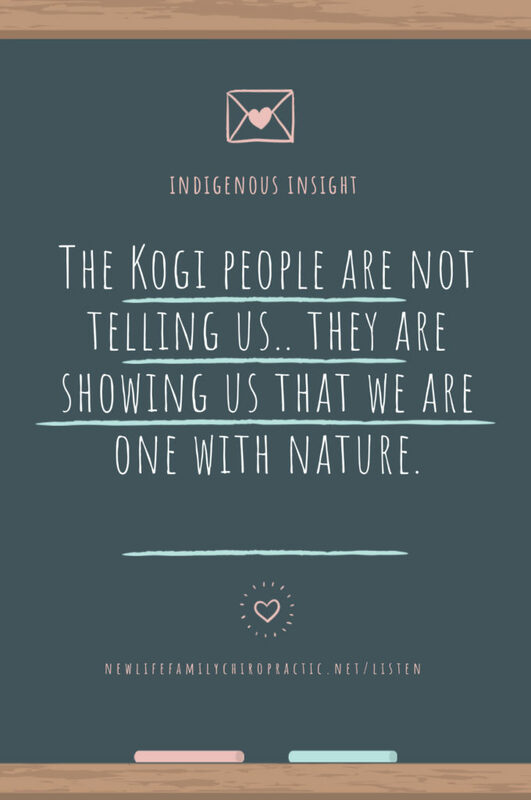 The people of Kogi teach us that in doing so, we destroy the body of nature, just as if you cut off a person’s limb, or removed a heart or another vital organ. The wellbeing of every species on the planet depends upon the welfare of all. How do we know that when we destroyed our natural world, that we have not removed a vital organ of our planet? Have we destroyed what the Kogi people call an esuana- a critical node on the back thread scaffolding the natural world? How do we know that we have not killed a sacred tree, what the Kogi people call “the father of the species”? The father of the species is, on the whole, the interconnectedness of every species. Modern science recognizes what the Kogi have always known. An invisible web of a beneficiary does indeed connect every place on Earth, as does its causalities. We truly are animated earth. 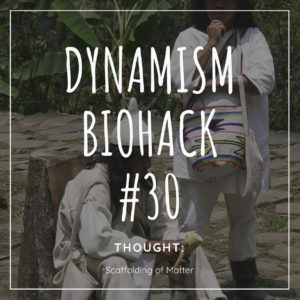 Dynamic people know these effects as manifestations of a general principle of interconnectedness. They do not exploit another person for their own gain. They know that nature, too, is a full subject. What will you do to protect esuana? 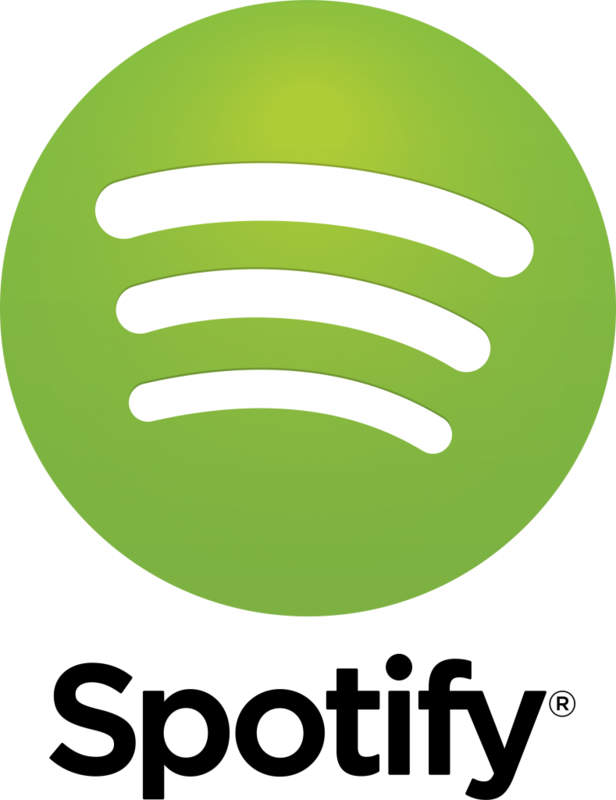 What are you doing now and how does it make you feel? The Kogi people are the largest intact civilization that has remained separate from global industrial society. Whether Dynamic people know it or not the creed and mission to protect themselves and their families, match that of the Kogi women. The Kogi women believe that when a baby is born, you must have good thoughts. They believe in teaching the example of others who have lived well. If they don’t teach this, they know the child will grow up not knowing how to think, how to make a conscious choice. They teach the child to be the teacher of the next generation, to carry on the thread. How will you learn and carry on the thread of Dynamic health in your life…. family… community…. world? Human beings search to be a part of a group, or a community certainly is at the center of survival for humanity as exemplified in tribal communities throughout the ages. Tribalism in no doubt is a cultural universal identified by paleoanthropologists as one of the salient characteristics that have defined humanity since the beginning. Even other branches of science like biologists or ecologists note that humans are like packs of wolves. In that, we need each other to live a long happy life. When a wolf leaves its pack, it can become very aggressive, suffer mental illness, and even give up on life ending it in suicide. An interesting comparison when we look at our society today and notice the troubled peoples who have been isolated either by the fault of someone else or by their own choice, they become like a lone wolf. Many become socially maladapted, depressed, without purpose, mentally ill and suicidal; some develop violent, aggressive tempers and even murder others before ending their own lives. Humans, like wolfs, are better to be a part of the pack, then to be lonely and isolated from one another. Literally, science is tracing our bonds in our bones. In an iconic photographic masterpiece photographer, Jimmy Nelson captured some of the last tribes from around the world and published it in his book, Before They Pass Away. Jimmy Nelson gained his inspiration from Curtis because one hundred years later- look at America. Author Michelle Henning had an interesting conversation with Nelson about his inspiration with Curtis. Nelson’s recollection from visiting the last tribes from around the world noticed a family bond that will forever chime within his bones. For the indigenous peoples all over the world, life is about the survival of the fittest. The harsh climate is what it is, healthy babies make it, and unhealthy children do not. He noticed that those born healthy, functioning, and living, tend to stay living a healthy life. Indigenous don’t worry about the future or read books about when they’re going to be happy. They just are. They have their tribes and families to thank for that mutual support. One of the most important concerning the survival of the fittest for these infants was breastfeeding. Nelson explained that 100% of the babies are breastfed until they are about four or five years old.